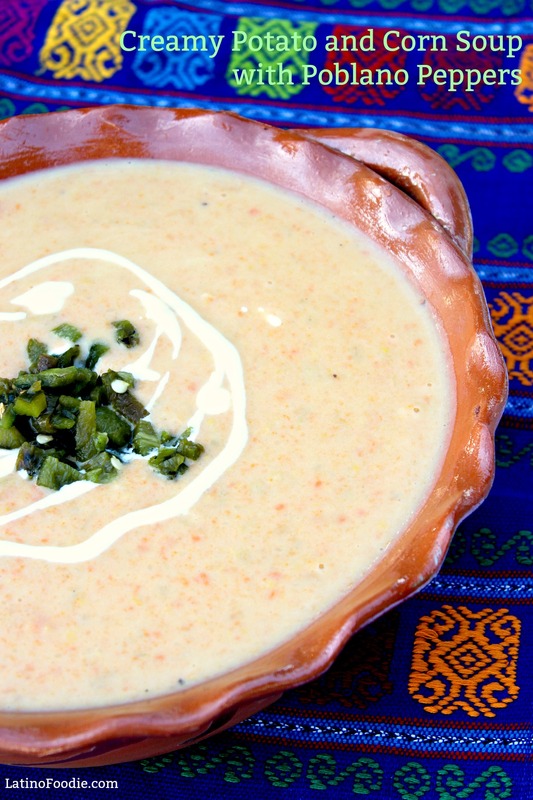 In autumn, we love playing with American classics soups and stews and making them our own like this Creamy Potato and Corn Soup with charred Poblano Peppers made with whole milk. What’s more luxurious than a creamy soup made with whole milk? We’re in the middle of Hispanic Heritage Month and nothing speaks louder to me than food, comida, as part of my Mexican heritage. Being second generation (and 4th generation on my mom’s side of the family), I am also proud to be an American as my family has experienced great opportunities in this country. As a nation, we are going through some difficult (to say the least) times and so it is important that we value and cherish our culture and bring it forward. If you think about it, all of the main ingredients here come from Latin America — the corn (maiz) and poblano peppers coming from Mexico and the potato coming from Peru. It’s a perfect dish to celebrate Hispanic Heritage Month, especially during the cooler days of fall. 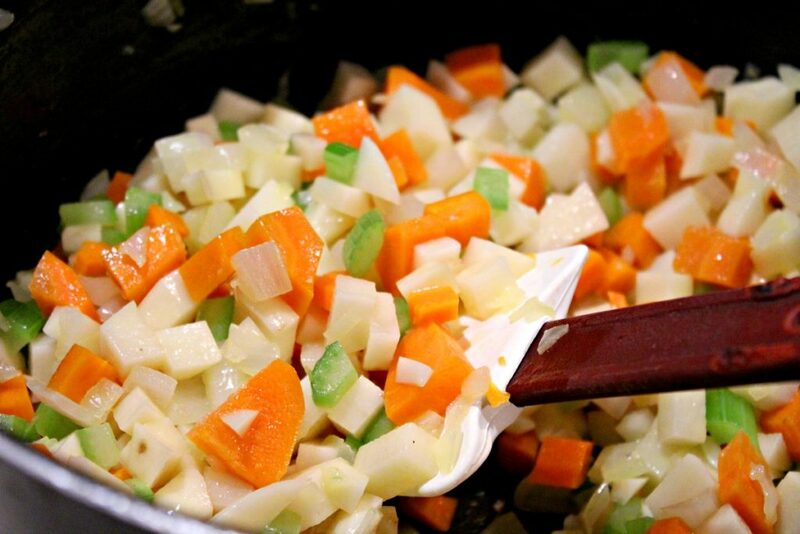 A traditional Mirepoix au maigre starts off the recipe (onions, carrots, celery) to provide a solid flavor foundation as we add the potatoes and corn to the stockpot. Once we simmer all of the vegetables in good quality chicken stock, we slowly pour in the whole milk, stirring frequently. We drink lots of milk in our household. We find milk an affordable source of high-quality protein, offering nine essential nutrients, like calcium and vitamin D, including eight grams of high-quality protein, which is important to keep these big bears feeling full and ready to conquer the day! The potato and corn soup is hearty enough to eat alone with a crusty baguette or as a starter to a fine meal with friends and family. 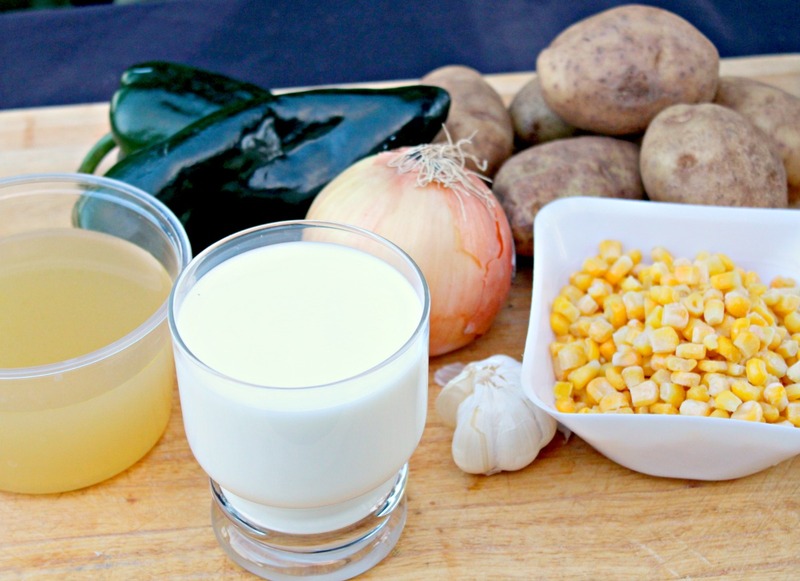 We hope you enjoy our recipe for Creamy Potato Corn Soup with Poblano Peppers. Here’s a quick little video to inspire you. Rinse the poblanos and rub with olive oil. Roast them over a gas stove until blackened on all sides. Place the charred poblanos in a plastic bag for 20 minutes until they have cooled. De-stem and de-seed the poblanos, chopping them into small pieces. In a large stock pot, add olive over medium-high heat. Add the onions, carrots, and celery. Saute until softened about 3 minutes. Add the potatoes and chicken broth and bouillon. Bring to a boil. Remove half to 2/3 the soup and blend in batches in a blender/food processor until completely smooth. *Use caution when blending the hot soup. Pour mixture back into the stockpot through a sieve to discard any leftover pulp. Add in the milk, stirring frequently. Stir in heavy cream and continue to simmer for 5 minutes. 10. Serve in bowls garnished with pieces of the charred poblano peppers and croutons (optional). As we’re scurrying about our day, a balanced diet including smart choices like milk, with its 9 essential nutrients, can help us power through it. Milk is the top food source of three out of the four nutrients of concern – the nutrients that Americans, including children, are most lacking – calcium, potassium and vitamin D.